So does Transport Canberra's new network. If your child will be catching a bus next term, you can go on to the Transport Canberra website for more information, or access the note on this website. Learning Journeys for all classes will take place next week. Dates and times are shown below and all Learning Journeys take place in the classroom. Come along and marvel at what your children have been learning and producing. Swimming lessons for Kindy to Year 3 start next Monday, 1 April and continue every school day until the end of term (Friday, 12 April). Swimming lessons will be at the Lakeside Leisure Centre, Tuggeranong. Lesson times for each class are shown in the table below. Please note a new class timeslot for KT has been scheduled. plastic bag for wet items. Don't forget our special Harmony Day assembly is at 2pm this Friday in the Old Hall. All are welcome. Also children can wear national costume or orange to school on Friday. Please send children to school tomorrow with some tongs or gloves (rubber or gardening) for our clean up of the school grounds tomorrow. Nominations for three vacancies for Parents and citizens members on the Torrens Primary School Board opened on Monday 4 February at 11am. The nomination period remains open until 11am Monday 18 February. Nominations must be made on the Nomination Form available at the front office or find it here. The Torrens Primary School Board has three parent vacancies for 2019. These vacancies are all for two-year terms. Nominations open Monday, 4 February 2019 at 11.00am and close Monday, 18 February 2019 at 11.00am. Nomination forms will be available from the Front Office from Monday, 4 February 2019. The Year 6 students are due back from Sydney tonight at approx. 7pm. To complete the survey online, please follow this link. Torrens Primary School is celebrating its 50th year in 2018! Torrens Primary School will host an Open Day on Sunday, 9 September from 11am until 2pm. Come along and join in the fun! Next Friday, 3 August Torrens Primary will celebrate what would have been Nelson Mandela's 100th birthday. Read about this great man and Zanie's (Year 6) initiative to raise funds for www.kidsfoundation.org.au in honour of Nelson Mandela Day in this week's Torrens Times newsletter. To accommodate the Being Brave incursion this week, Assembly on Friday 29 June is on at the earlier time of 10am in the Old Hall. The walkathon raffle will also occur during this assembly. Don't forget Queen's birthday holiday on Monday. Then gymnastics for Yr K thru 2 commences on Thursday 14 June. Kindy Assembly is on next Friday at 12.15pm, followed by the 2018 Torrens Talent Quest final which will commence at 1.45pm in the Old Hall. Because the walkathon is taking place in middle session tomorrow, Assembly hosted by Year 1 will be on at the later time of 2pm in the Old Hall. The latest ETA for our Year 4 Berry campers is between 4 pm and 4.30 pm today at school. To accommodate Naplan testing, Assembly tomorrow will be on at the special time of 2pm. Owing to predicted bad weather for this coming Friday, the Kindy Zoo & Aquarium excursion will now take place on Friday, 18 May. Swimming lessons for Kindy to Year 4 continue EVERY school day now until the end of term (Friday, 13 April). If you need to know lesson times, please contact the Front Office or refer to current newsletter where a timetable is published. 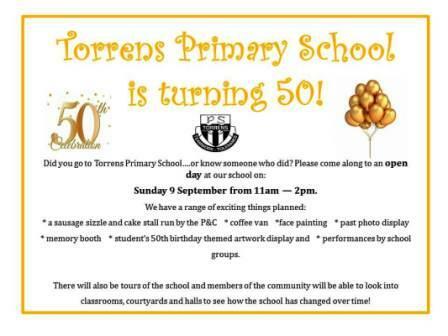 Torrens Primary School turns 50 in 2018! We invite past and present staff, students, families and community to join us in celebrations during Week 7 in Term 3 (August). More information will become available on our website and in future newsletters. If you have any ideas or memorabilia for our celebrations, please get in contact via our Front Office or email admin@torrensps.act.edu.au . Remember that Parent Information Sessions are being held for all year levels next Wednesday, 28 February from 5pm. A flyer has gone out today showing the session timetable. Please note the changes in start times for the Year 5 and 6 sessions. As a result of parent feedback, Year 5 and 6 sessions will both now commence at 5pm. Online lunch order service remains unavailable at this time. Please note that the online lunch ordering facility is currently unavailable until further notice. Apologies for any inconvenience this causes. Don't forget the following dates, times and info for the last week of school for 2017! This assembly will commence in the old hall at the earlier time of 12pm on Friday, 8 December. Further rain is expected today and tomorrow and so the Senior concert will commence with the choir at 5.45pm in the Old Hall tomorrow - Tuesday, 28 November. Congratulations Mrs Matthews on winning the role of Principal at Torrens Primary School! These are now available for ordering online from OfficeMax. Orders will be delivered to your home or place of work. Free delivery applies to orders placed by Sunday 17 December and zipPay allows you to order supplies now and pay later. The school's access key for placing orders is 4RX2Q (the code is case sensitive). A hard copy of your child's 2018 year list and ordering instructions will come home in school bags today. Any queries please ask at the Front Office for help. Orders must be in and paid for by tomorrow, Friday 27 October. Sorry but no late orders can be accepted. As we have heard nothing to the contrary, please assume the Year 6 happy campers will return to Torrens tonight between 6.30 and 7pm. Tomorrow is our Dress as your favourite book character day and assembly will be at 12.15pm. We are expecting Year 3 Birrigai campers to return to school at 3.10pm this afternoon. The school newsletter Torrens Times is available online every Thursday afternoon during term time. It will always list important dates and events and when various excursion notes and payments are due. For example, the Sports Awards assembly is on Friday, 4 August (Week 3) at 12.15pm. If you have missed a note, you can always find a copy under the Recent School Notes link on the right hand side of this homepage. Most excursions will require a completed Excursion Medical Consent form. You can download this from the Medical Information and Forms link on the right of this homepage. Save it to your hard drive to fill, print and reuse for all excursions. You can pay for most excursions and the like by accessing the Payment link at the top of this homepage. If you need any help at all, call the Front Office on 6205 7411. We are only too happy to assist! I am writing to inform you that I will be taking long service leave at the end of this term before retiring in November. I have been very privileged to have been able to have a career doing something that I love and have had a fabulous time working (and playing) at Torrens Primary School. I wish all staff, students and their families all the best for the future. But it is now time for me to pursue other interests which I am very much looking forward too. In my absence Rachel Matthews will be assuming the Principal’s role before it is advertised for permanent filling. Louise Zietlhofer will take up the Deputy Principal’s position and Kelly Knox will be our new Executive Teacher. K-2 Gymnastics program starts on Thurday 8 June. Please return permission note and medical to the front office by Tuesday 6 June. Google Docs on the Chrome Books for Parents presentation is on in the library Tuesday 6 June from 6.30pm - 8pm. iBean Café is on again! Friday 9 June from 2pm-3pm, in the new hall. Walkathon Sponsorship is due to the front office by Monday 26 June for the raffle at assembly on Friday 30 June. The Torrens Disco is on tonight in the Old Hall! Entry via Batchelor St only. Cost $5, includes entry, drink and BBQ. Don't forget your signed permission note and all children must be collected from the hall - no exceptions! Week 1 of Term 2 starts on Wednesday 26 April. Online enrolments for Preschool and Year 7 2018 open on Wednesday 26 April and remain open until 9am on Monday 29 May. Learning Journeys for all classes are on Friday 28 April in the classrooms. You are welcome to visit your child's classroom between 9.15am and 11.00am on that day. Our special ANZAC Day assembly is on Friday 28 April at 2pm in the old hall. You are warmly invited to attend. Don't forget that next Tuesday is our Harmony Day celebration at school. We are now expecting our Year 5's back slightly earlier at 3pm today. Year 5's are currently enjoying themselves at camp and all is well! This service is available to order lunch on Thursdays and Fridays during term time. To set up an account go to www.flexischools.com.au and click on the 'Register' link. The Torrens Primary School Board has three parent vacancies for 2017. These vacancies are for two years. Nominations are now open and close 11am on Monday 13 February 2017. Nomination forms are available from the Front Office. Completed nomination forms may be lodged by hand to the Front Office, or by email to christine.hynes@ed.act.edu.au , or by post to Christine Hynes Assistant Returning Officer C/- Torrens Primary School, Ritchie Street TORRENS ACT 2607.